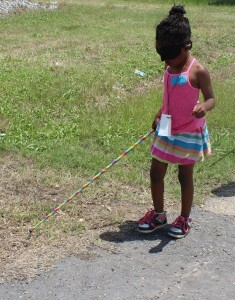 A first-grader with low vision, who has so far been reluctant to use a cane, now cannot wait until she gets her first cane after using a “story box” created by Paige Morra, a graduate student in the Teaching Blind Students program at Louisiana Tech University. 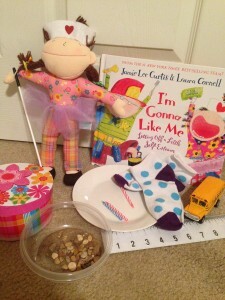 Based upon the book “I’m Gonna Like Me” by Jamie Lee Curtis, the story box contains an assortment of manipulatives representing items that are mentioned or described in the book. When teachers come to a page marked with an icon of a box, they can introduce the tactile object to the child. If the child is familiar with the objects, it can also be fun to have the student find the object while reading the story. The story boxes help connect words to their meanings, said instructor Laura Bostick, MA, NCLB. Morra’s box included the main objects of the story and even some that were just mentioned once. Other objects in the box included print-braille alphabet magnets, a braille ruler, a get-well card, a plastic ring, a glass plate, and even a plastic container of dirt and pebbles! Bostick teaches the Developmental Aspects of Blindness course, which is required for all graduate students in both the Teaching Blind Students and Orientation & Mobility programs at Louisiana Tech. The story box project, she said, brings together some of the course’s main themes. As for the outreach student, the epiphany came just a few weeks before she attended the Braille Enrichment for Literacy and Learning (NFB-BELL) program, during which she received her cane and had her first orientation and mobility lessons. « Is Your UEB Training Accessible to Everyone?